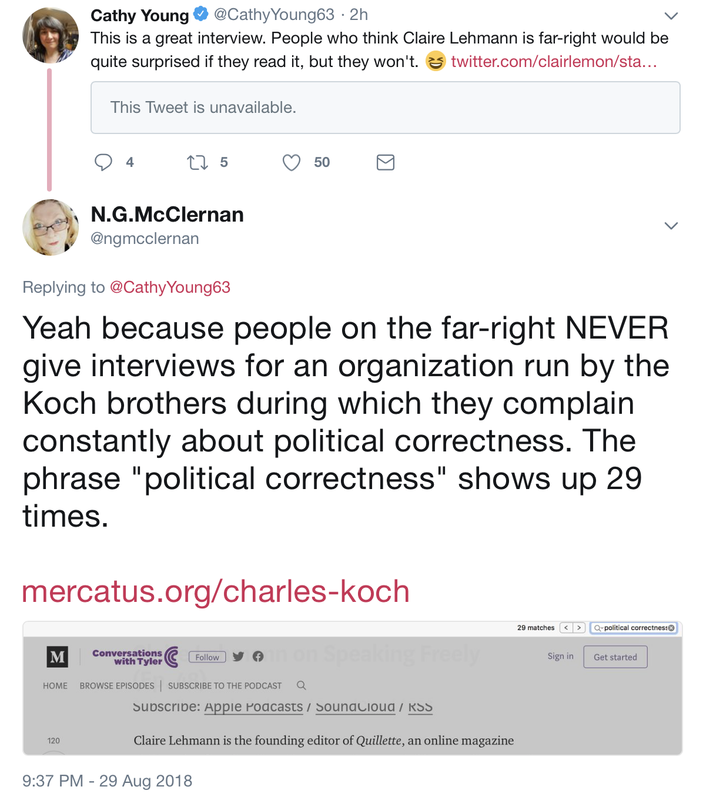 Just when I thought my opinion of Cathy Young could go no lower, here she tries to argue, with the inane laughing emoticon she favors so much, that Claire Lehmann isn't really far-right. The project to brand Quillette as centrist never ends. The Mercatus Center, which sponsors "Conversations with Tyler (Cowen)" is notorious for its Koch brothers connection as the New York Times discussed last May. As early as 1990, entities controlled by the billionaire brothers Charles G. and David H. Koch were given a seat on a committee to pick candidates for a professorship that they funded, the records show. Similar arrangements that continued through 2009 gave donors decision-making roles in selecting candidates for key economics appointments at the Mercatus Center, a Koch-funded think tank on campus that studies markets and regulation. The appointments, which also created faculty lines at George Mason, were steered to professors who, like the Kochs, embraced unconstrained free markets. 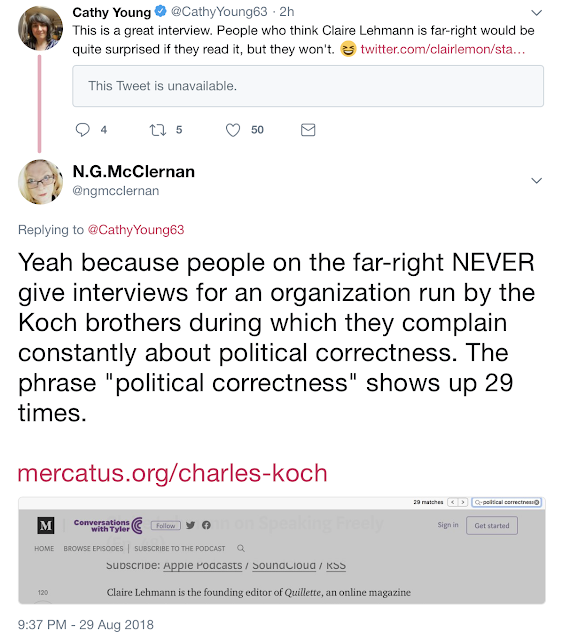 This tweet isn't only significant for its demonstration of Cathy Young's inanity, it is the first proof I've seen of a direct connection between Quillette and the Koch brothers. I knew Quillette had published articles by Reason contributors of course, but I hadn't seen any direct connection between Lehmann and any Koch organization. I had thought before it's very likely there was a funding arrangement between the Koch brothers and Quillette - now I'm sure of it.